That's all from me, at least for some long time. Impressive is, that if you expand behind the river, so your Castle will be level 8 and up, you will get access not only to the "Lady of the Lake" but also to some different essences. I have now production of 228 scrolls per day, after expanding shelves and trying to accumulate required gems, to get even further. The essences were much welcomed, as well as that one Diamond Idol. Scrolls wrote: A scroll containing ancient knowledge to increase technology in your Kingdom and create Creature Enchants. How many? Thousand and gems and golds and tombs and holds (a prayer)..
Last edited by Pol on Sep 21 2017, 17:53, edited 1 time in total. 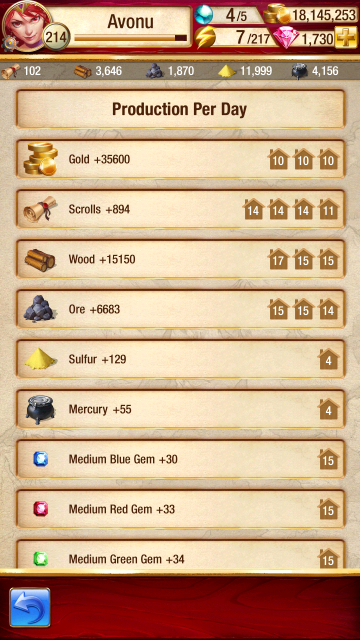 I'm still proud on my 288 scrolls! What Castle level do you have? You can see it by looking on scroll production - it's the last one (as Castle also products scrolls) - but I have leveled it a bit and it's at 13 now. Mine is also 13 right now, albeit having only 588 scrolls per day. Essences were pleasant. But where I should get Brimstone, any tips to speed it up? On higher difficulty you get better materials (brimstone/enchanted brimestone, quicksilver/enchanted quicksilver). IIRC you can also buy them from traders in your Kingdom too. My friend's fully explored Kingdom (you need to have level 20 Castle for that). As you can see, there isn't place to put all your buildings on map (4 buildings are missing), so you need to plan wisely. My advice is to forget about Treasures or maybe about 1 of each resources Mines, as Shrines are too good to not place them (especially level 15-16 shirnes, which boost creature stats for each colour - blue, red, etc.). 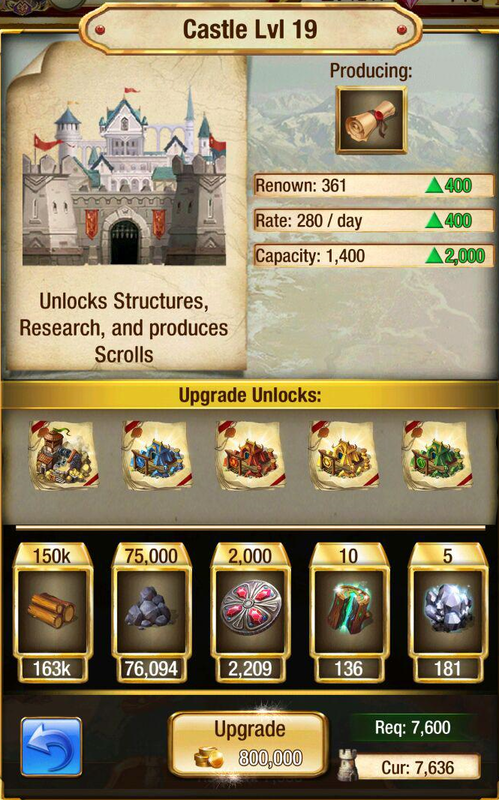 You will also need a lot resources to upgrade your buildings, plus a lot of scrolls to buy new upgrades. 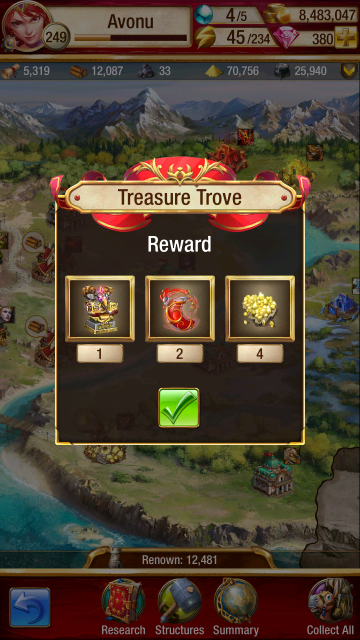 Money is the easiest resource to obtain from Quests (especially form The Wealthiest Tavern). Can you ask him approximately how much resources it does cost him? Just that I remember that my almost five millions went to zero and I'm nowhere close to this. Probably couldn't count used wood & ore, 25 000 so far.. perhaps. +2 x 2,5M to explore last "provinces" of Kingdom map. Is this your castle, Avonu? Galaad wrote: Is this your castle, Avonu? Nope,my castle is only level 14. I could upgrade it to 15 right now but I prefer to develop my libraries and mines first. I was wrong, Kingdom isn't that much pay to win. I recently learned a 100% free player could rush to Castle 20 in two weeks. I also had a talk with a VIP1 who currently is at 22. We're just too casual, these folks can likely compete with high spenders. Last edited by Galaad on Oct 17 2017, 19:19, edited 1 time in total. Who said, that this is not possible? This is mere question of resources. Never got an Idol from her, although I'm trying to accept her bid daily for Greater Essences. BTW When there was Token Action, the Gold chest can provide you with both, Greater Essences or Idol. Though again, never got here Legendary Idol. 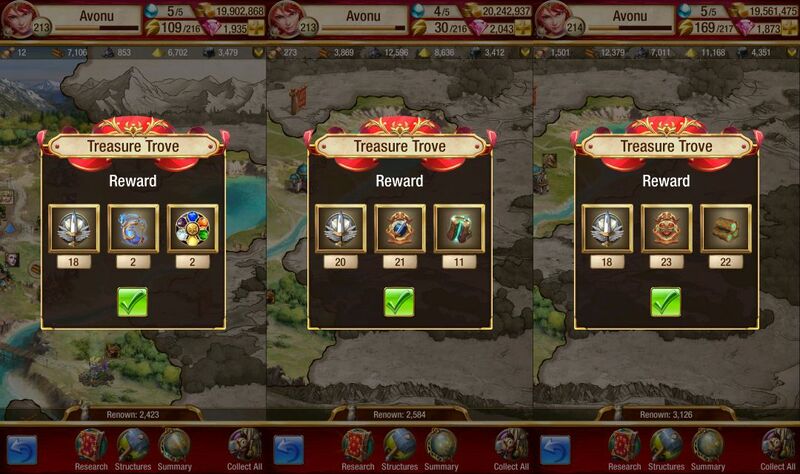 Staying before Castle LVL20 upgrade, so still seeing the same screenshot as Avonu posted above. Meanwhile fixing my economy and shrines. Close future looks like to reveal last two areas for 2,5 mil each and then I will also see the whole map! Now, several times happened to me that instead of QC I received Prismatic Orbs, though interesting, QC would fit me better.